Richard Burton was the son of Lieutenant Colonel Joseph Netterville Burton. He travelled with his family to France and Italy. I n1840 he started hid studies at Oxford, but he was expelled after attending a steeplechase. He joined the army of the East India Company in 1842 and was sent to Gujarat, were General Charles Napier was in command. In India he learned several languages, including Arabic and Persian. In 1849 he returned to Europe on sick leave. During a visit to Boulogne he first met his future wife Isabel Arundell 20 Mar 1831-22 Mar 1896), a Roman Catholic girl from a good family. In 1853 he succesfully made a pilgrimage to Mecca, disguised as a Muslim. He published his experiences in "A Personal Narrative of a Pilgrimage to Al-Medinah and Meccah". Afterwards he rejoined the East Indian Company, but soon he planned another expedition, supported by the Royal Geographical Society, this time to the Somali Country. But he and his fellow officers were attacked by warriors and he was wounded by a javelin. One of them was John Hanning Speke, who also survived. Between 1856 and 1860 he explored the African Lakes with Speke in search of the source of the River Nile. Before he left he was secretly engaged to Isabel Arundell, whose mother didn't approve of him. He didn't find the source of the Nile and returned separate from Speke, who located Lake Victoria. In 1860 Burton visited the USA and in 1861 he married Isabel without converting to Catholicism. Soon he left her behind to become consul at what is now Bioko in Equatorial Guinea. The climate was considered unhealthy for Europeans and therefore he went alone. Meanwhile, Speke went for another expedition and after his return he claimed that he had found the source of the Nile. Burton doubted this and a debate between them was planned for the Royal Geographic Society on 18 Sep 1864. But that morning shot himself with his own gun while he was hunting at Neston Park, Wiltshire. His death was supposedly accidental. In 1865 he was transferred to Santos in Brazil and Isabel went with him. In 1869 he was appointed consul in Damascus, where he and Isabel befrieded Lady Jane Digby. But he made many enemies there and in 1871 he was transferred to Trieste, where he lived with Isabel. He wrote many more books, but most of them weren't received too well. In 1883 he translated the "Kama Sutra" and in 1884 "The Arabian Nights". On 5 Feb 1886 he was knighted by Queen Victoria. After his death in 1890 in Triest Isabel called a priest for the last rites, allthough he hadn't been a Catholic. She never really got over his death and buried many of his papers, possibly to protect his reputation. She returned to London and wrote a biography about him before she died in 1896. 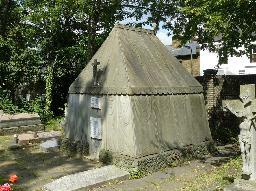 They were both buried at Mortlake Roman Catholic Cemetery in London. Their tomb has the shape of a Bedouin tent. 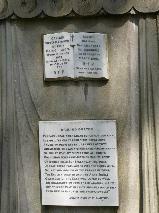 The grave of Sir Richard Burton at Mortlake Roman Catholic Cemetery, London.